Above is a screenshot of widgets in different widgets areas to create “Business Layout” in the Sunshine Pro theme. 1. Before Header widget area contain a text widget with text aligned left using (text-align-left) class and text align right using (text-align-right). 3. Sliding Panel Right widget area contain a text box with code to display contact information (For code: refer Footer widget 2 below). It is followed by text widget with “Contact Form 7” shortcode and eNews extended widget for email sign up box. 1. Home Top widget has “Simple Pro Banner” widget with following text contents. Background image is selected from widget settings and make sure to check “Transparent Background for Content” option. 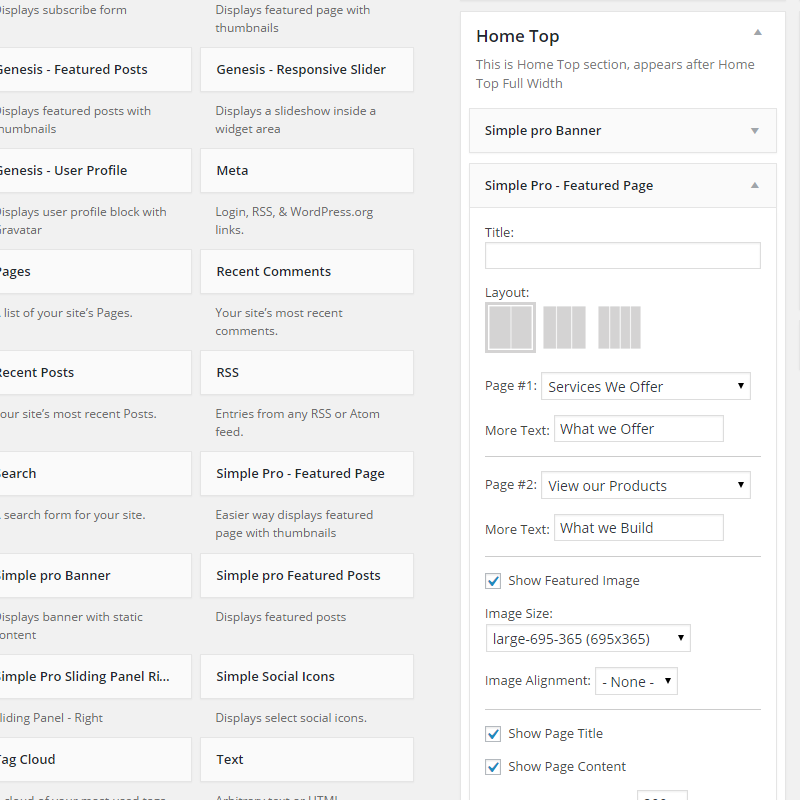 This is followed by “Simple Pro Featured Page” widget with 3 columns layout and other settings as seen in screenshot below. Then we have another “Simple Pro Banner” widget with background image selected and following code in the content box. 2. Home Middle Left & Right widget areas contain “Simple Pro Banner” width background color select and text using H2 tag for “middle left” and H3 tag for “middle right”. 3. Home Bottom widget area has “Simple Pro Banner” widget with background image and text contents as seen in the screenshot. Then we have “eNews extended widget” and “Simple Pro Featured Posts” widget with 3 columns layout. Lastly, a “Simple Pro Banner” widget with background image and following contents. Footer Widgets 2 contain a text box with contact information created using following code. Footer Widgets 3 contain eNews extended widget to display email subscription box.